FIFA 16 has stormed onto consoles and PCs, packed with lot of new content and features that can be confusing to beginners, or even the old fans who are returning to the game. With deep and refined gameplay, the game is challenging but rewards virtual footballers with sweet moves and goals. In FIFA 16, the game pace is considerably slower and penalizes players who insist on trying to cross the field with sprinters all the time. Although it seems a good idea, very long runs through the defense will make you lose the ball again and again. To improve performance, appeals to exchange more rhythmic passes. This will give you time to notice flaws in the defense and arming the counterattack the opponent. The temptation to start the online mode of FIFA usually huge, but it is definitely not suitable for any player. Before venturing into online play mode Seasons or Ultimate Team, invest a few hours in matches on the PC or consoles. At higher difficulty levels, machines will offer a decent challenge and will give you time to get used to the mechanical, controls and features of the gameplay of FIFA 16. A good team starts with organized defense, and FIFA 16 you need to deploy to keep the boom in order, or suffer an avalanche of goals in more complex games. It is important that you don’t embezzle the defense to move much with the defenders, either to attempt an attack or disarm the player to stop. Pay special attention also with tackles, which must be performed accurately, or leave your goal exposed. Another nice alternative for getting to the goal is the dribble, which is more efficient than ever. Using the right analog stick, you can make passes of various kinds, in various directions. It is important to select skilled players to dribble, or the result will invariably disastrous. The likes of Neymar, Cristiano Ronaldo, Messi, Bale and Ribery Robben are ideal. Much more than the good old friendly and Career Mode, FIFA 16 has good variety of game modes, which still provide more useful life to the game. Try not to become bogged down in only one mode, and try to take the title options. Another important part of the game that has gone through changes were the kicks that are more real and a little more complicated, and you don’t need to worry about losing too many easy goals in the first game. To take best advantage of the chances, use a bit more force kicks. This way, it will hamper the lives of goalkeepers and you can even get real exploit. Placed movements and crawling are also great choice to hit the target without problems. Real Madrid, Barcelona and other major European football teams seem obvious choices for the matches of the game, but in practice, the story is quite different. Even with so many high level players, the teams have different strategies and are very different to control. Be sure to try several teams in the game modes. In addition to not get tired of a team, you will also learn different playing styles, which are often imposed by limitations and formations. - Select the best available player with high shooting power and ordinary kick values and also take a look at the overview of the strongest players in the team. - Also notice the player's strong foot. For a hard kick from the left side in front of the goal should choose the left playing shooters, on the right side in front of goal, accordingly, a shooter with a strong right foot. - Set the camera so that the outermost player from the opposing wall is in line with the post on your site. - Hold LB / L1 and the left stick in front of the shot to the front and push the shot button (B or circle). - Fill the bar for the surplus power until the third field. The further one protrudes from the net, the stronger shot must be placed. - Once again select the perfect shooter, care should be taken primarily on a high kick and effect- value. - On the left side in front of goal you choose this time a player with a strong right foot on the left side of the door accordingly a player with a strong left foot. - Now aim to the innermost two players of the wall and pull the stick in this case 45-degree angle to the top left or top right corner of the net. - Shoot with B or circle. - Fill the Shot Power in the penalty area, this time with only two strips on. - Now the ball should end up with unsustainable swerve past the wall for the goalkeeper in the corner. 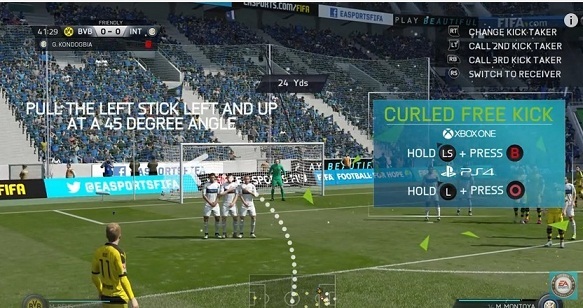 Those who have already played the previous games in FIFA series, have no problems with the control of the shooting in FIFA 16. Before you go for the penalty kick, you should select the right shooters. It depends mainly on the shot value and a high precision. - Keep the red-green bar at the bottom right of the screen in mind. - The cursor must be placed in the green area as possible, in order to accurately shoot. - Pres the shot button shortly before the ball lands in the middle of the bar. - Place the cursor in the red zone, to start from a missed shot towards the audience. - Load the bar shot up about halfway. Again: The stronger the shot, the less precise is the penalty. If too much power expended for the shot, the ball goes far beyond the gate or in towards the corner flag. - Directly after releasing the shot you must now opt for a corner. - Pull the left stick in the corner of the net, in which the ball is hit.